Hey there! So sorry for the lack of updates lately. Anyways, here's a collective haul I got last month. I got several stuffs from L.A. colors because they were having a big sale. I knew I just had to have a lot of good stuffs. I'm also very happy my sister and I found these art deco nail polishes. Now, we wouldn't have a hard time designing our nails. I also got myself the E.L.F. blush in peachykeen. Now this is something new from the range of blushes I have because this time, the shade is more coral-ish - peachy compared to my favorites- which are in pinks. I'm actually stuck with this blush right now. It kinda blends well with my complexion now after I got a little darker from sun exposure. I'm setting aside my other blushes first and I'll think this E.L.F. blush will go along way. Not to mention that is cheap too. My sister and I also purchased these cute rings. I'm actually inlove with bow stuffs right now. From rings to necklaces, and tops. The first two rings were bought at Just G and the gold one I found at the SM Department store, accessories section. 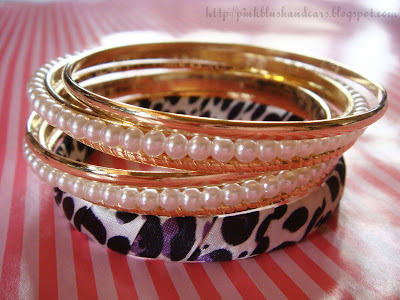 And finally, I found these pearl bangles. It was way cheaper from the ones I saw before that's why I'm so happy with these purchase. I actually saw them while I was paying at the counter at Genevieve Gozum. I also bought a couple of tops. The black top I got from SM department store. It has a cute flower design and I also love the hemline which is weird. The white top is from Genevieve Gozum and the last 2 tops from Terranova. Lastly, I got myself a new pair of jeans from Levi's. I think this is from their new collection called Curves which says it hugs your curves perfectly. Kinda pricey for 3499php but I'm very contented with the fit. Everytime I buy a new pair, Levi's is actually my first choice because it fits on me well. So I think that's it for now guys. I actually have more reviews due already. But I'm focusing on my review now. Next I'll be reviewing my current haul from Revlon (photoready foundation and 2 lipstick from their colorburst collection). @abby: I actually got mine in Ayala Cebu, I'm pretty sure there are stores near you carrying L.A. colors. Thanks for the follow and comment dear!